HOME PRODUCTS &AMP; SERVICES DIRECTORY OF SUPPLIERS ENGINEERED PLASTIC PRODUCTS, INC. Engineered Plastic Products, Inc. (E.P.P.) custom forms and fabricates sheet thermoplastic materials into products for industrial and commercial applications. For almost 60 years, E.P.P. has been in the business of thermoforming and fabricating specialty thermoplastic materials for companies such as Zodiac, Boeing, GE Aviation, and Stryker Orthopaedics. E.P.P. 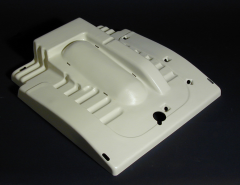 's commitment to customer service in all phases of manufacturing from design engineering to production assembly is why they have achieved considerable recognition as an outstanding source for thermoformed and fabricated plastic products. E.P.P. has the versatility to run products in sizes up to 72" x 108" in a large array of materials. Among the thermoplastic materials utilized are standards such as ABS, PVC, Acrylic and Polycarbonate. Also used are specialized materials that can provide super high impact strength, withstand high or low temperature environments, or provide ESD protection. Many materials used are approved by various regulatory organizations such as FAA, FDA, NSF and UL. They also perform many postforming operations including machining, assembly, and finishing. All operations are subject to rigid quality controls to insure on time, zero-defect deliveries to their customers. In addition, E.P.P. maintains a network of stocking distributors, specialized fabricators, and precision machine shops that are constantly audited to maintain quality standards. This allows them to provide a full range of services to meet any plastic part requirements. View More Announcements from Engineered Plastic Products, Inc.